Physical Therapy and Joint injections are the preferred method when it comes to managing the signs and symptoms of chronic hip pain. In the case of the severe chronic pain a surgery might be an option. We always consider a non-invasive treatment options first before we turn to more invasive procedures like minimally invasive surgery. Pain Physicians NY (Brooklyn & NYC) provides a full range of advanced rehabilitation and pain management services including electrical nerve stimulation for chronic hip pain among latest cutting edge procedures: Body Composition Analysis, High Tech Shockwave Therapy, groundbreaking Interstitial Laser Therapy. Around the midriff is the largest ball-and-socket joint in the human body, which provides a connection between the femurs of both legs to the pelvic bone. A cushion of cartilage along the joint helps to keep the leg movements smooth and frictionless, but with time, it’s bound to wear off which causes a hip pain. Chronic hip pain is also commonly known as trochanteric bursitis. Improper posture, differences in the length of the legs, or certain types of sports put you at a higher risk for chronic hip pain. 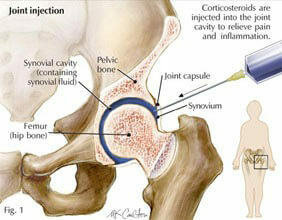 This is an autoimmune disease that causes an inflammation of the hip joint. It may arise due to an injury, age or infection to the joint, and there is unfortunately, no cure for it. It can be managed, though, with certain medications and physical therapy to reduce its signs and symptoms. Bursitis: it is an inflammation of the bursa – the sack of fluid found between the hip joint that provides lubrication. A direct impact to the bursa through a fall, especially on the outer hip, may cause the bursa to swell. As a result, every time when the tendons rub over the bursa, you may experience a sharp pain along the outside of the hip. This condition is usually severe and causes severe pain over the time, which tends to get worse. Sprains and strains: these are common especially among athletes and other sports, caused usually by an injury to the ligaments and joints. They aren’t serious, though, and will usually heal with proper medical care, physical therapy, bed rest and certain medications. Broken hip: due to an injury or trauma to the hip, there is a big chance for a hip fracture. Fractures cause severe pain, but this, too, can be healed with proper medical care and the right diagnosis. However, it is not very easy to break a hip, as it is one of the most durable joints in the human body. It usually results due to factors such as malnutrition and gender, with women being at a higher risk than men when it comes to hip fractures. Women especially after menopause, due to a lack of Estrogen and Osteoporosis are prompt for hip fractures. Since some of the causes of hip pain are irreversible, people suffering from chronic hip pain may need to use over the counter painkillers and prescribed pain medications to relieve its signs and symptoms. Over the counter painkillers usually recommended are Tylenol, Motrin, or Aleve. Other prescription medications are also available which may be classified as corticosteroids or disease-modifying antirheumatic drugs. Before making the choice, it is very important to speak to your doctor to get the ideal medication for your condition. It has been proven that physical therapy can relieve most of the signs and symptoms of chronic hip pain by maintaining the overall health of the bones and joints. In fact, it is often the preferred method when it comes to managing the signs and symptoms of chronic hip pain. In the case of severe and debilitating pain, you might want to consider surgery as a treatment option for chronic hip pain. It has been done for years and greatly helps in relieving its signs and symptoms, but you might still have to incorporate physical therapy and medication afterward to complete the treatment. If you experience chronic hip pain pain and haven’t found lasting relief through more conventional arthritis of the chronic hip pain treatments, medical marijuana treatments offered by our doctors may be right for you. Call medical marijuana doctors of Pain Physicians NY with locations in Brooklyn, Queens, Manhattan and Bronx NYC to help you determine if medical marijuana treatment is right for your chronic hip pain. There is always a way for the treatment of chronic pain, regardless from its location. Chronic hip pain makes no exception. You just have to decide together with your doctor what will work the best for you. Pain Physicians NY (Brooklyn & NYC) provides a full range of advanced pain management services to help our patients return to a healthy and pain-free life style. Our approach to pain care is individualized, and we providing the most effective chronic hip pain treatment options and utilizing the latest technologies available in USA. The pace at which technology is growing can make last year’s methods obsolete. Our team is always at the top of their game and at the head of the pack.